A unique collaboration between a mall in the eastern suburbs, and key social service providers in Christchurch has given life to a community service unlike any other in our city. The Loft provides a range of wellbeing resources, such as health, community and social services in a centralised hub. This means that various organisations can work together on providing optimal care for people when they need it, which is often immediately. 13 agencies are involved so far at The Loft, from Aviva (formerly Christchurch Women’s Refuge), Plunket, to Community Law services and Citizens Advice Bureau. Some offer weekly clinics, and some are on site daily. Julie McCloy, marketing manager for The Loft, emphasises that The Loft is more than a co-location model. It is aims to make it much easier for people to get help and support through one welcoming front door. The name ‘The Loft’ represents both the physical space on the second floor of Eastgate Shopping Centre, and also the aspiration of ‘rising above’; this reflects a shared journey with families and the community to rise up and move forward towards our full potential. Reception at The Loft is staffed by a Tautaawhi Manuhiri (‘welcomes guests’) and a ‘Navigator’. This role ensures that people with complex requests or issues can walk in and the Navigator will work with them straight away to assess their needs and refer them to the appropriate service. This avoids the stress for individuals or families of having to work out what they need, and it lessens the probability of being referred to an agency at a distant location or clients using Google and potentially getting the wrong information. “When you’re in crisis, being referred to agency after agency is exhausting, time consuming, and frustrating. It can feel like a full-time job,” McCloy says. On average 300 people each year have used the Navigator service. Hundreds of others come in throughout the week to gather information or to see the partner agencies on site. 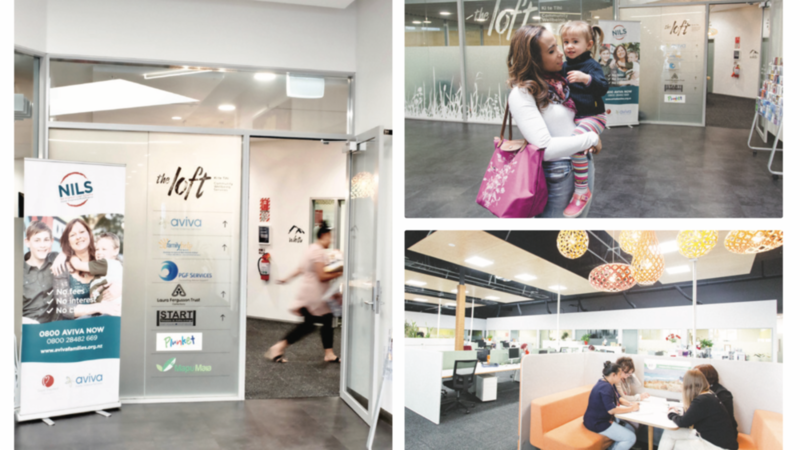 The Loft is situated next to an integrated primary health centre, allowing the centres to meet physical and mental health, social wellbeing, and community service needs. In working with the library and the healthcare centre, the three have managed to make the hub more of a community space for people. As well as dedicated breakout spaces, and rooms for larger meetings, the partner agencies share a workspace that has an open-plan environment. This means conversations happen naturally, and clients of The Loft or individual agencies receive more integrated help. The Loft currently receives no government funding, and solely operates thanks to some philanthropic support and generous donations, both monetary and goods. Members of the community and other organisations provide The Loft with much-needed items such as bedding, sanitary items, and even fresh vegetables. Food parcels are made up to deliver directly to clients. There has been a marked increase in service demand which is attributed to The Loft being so accessible and becoming known. It is also highly recommended to families and friends by people who have already visited. “We are here to turn the ‘too hard basket’ into a ‘kete of opportunity’,” McCloy says. Potential supporters are welcome to contact Aviva directly, or visit The Loft.